Printing and assembling a mask from PrintableMasks.net is easy and fun. You only need a few supplies and your imagination and you'll be ready to play! Once the PDF is open, select Print from the File menu. When the print dialogue box comes up, make sure the Page Scaling is set to "none." We recommend printing on cardstock, because it makes for a sturdier mask. There are two ways you can enjoy these masks. The first is by securing them to the face using string or elastic. 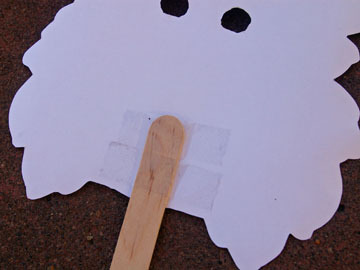 To do this, simply use a hand-held office hole punch or 1/4-inch craft punch to punch out the holes as indicated on the left and right sides of the mask. Then, tie a length of yarn, string, or elastic through each hole and tie the ends behind the wearer's head. You can also use these masks costume-party or puppet style, holding them up to your face. To play with the masks this way, use sturdy masking or transparent tape to secure a large craft stick (tongue depressor size) to the back of the mask. Then, use the stick as a handle. Play safely! Be sure to cut out the centers of the mask character's eyes so the wearer can see. 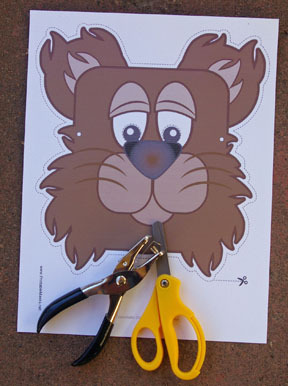 An adult can help with this part, as pointy scissors work best. Ready to go? Choose a free printable mask. All Printable Masks require Adobe Reader or another program that can display the PDF file format.